That’s my car, Milton “Miltie” Matrix in the above picture. He got into what we politely call a “fender bender” at a nearby shopping center. I had just picked up some Chinese food for lunch and promptly backed him into another car that was pulling out behind me at the same moment. The other driver said he had just come from a dental appointment. A dental appointment, huh? For all I know he might have been intoxicated from a high dosage of nitrous oxide. I mentioned this later to the cop who wrote the accident report; I thought she might have found it useful to know. She just laughed and kept her head down while writing. I can’t say ‘ol Miltie wasn’t trying to warn me, though. All those lunchtime hops to the Chinese takeout might be one reason for a slight uptick in my cholesterol count right now. In hindsight this was a cry for help for me on my car’s behalf. So where is blame being cast here? Well, Miltie is blaming it on the egg foo young; I’m blaming it on the other driver; and my insurance company has officially blamed it on me. Justice can be illusive. There just happens to be a barbecue chicken joint right next door to the Chinese takeout. Had the other driver only gone there instead of the dentist, I bet we could have come up with something interesting. That’s how they came up with the idea of peanut butter and chocolate, remember? Nowadays those two would be looking down at their phones, of course. Don’t you love their headphones? Anyway, there’s unfortunately nothing in my situation which can put me into a better light. I’m not going to try competing with a Mr. Perfect who does responsible things at lunchtime like getting root canals and crowns. Nope, I’m just the guy who’s in a hurry to get home and tie on the ‘ol feedbag full of MSG. I surely didn’t convince that cop, and I know I’m not swaying you either, dear reader. Even on the damage front I’ve lost. He was driving this big Chevy pick-up truck and drove away with only a small paint rub on his brake light; I have a dented rear hatch door. I am now someone to whom you mentally say “tsk tsk” as you pull up behind me at a stop light. Valet parking is now out of the question. About a week after this incident, we began the claims process with our insurance company. This turned out to be short-lived. Their adjuster looked over the car, filled out a zillion fields on her tablet, and estimated the replacement of the hatchback door to be around $1,500. She immediately cut a check to us for $500 and gave us a list of approved repair shops. The $1,000 difference to pay for the repair just also happens to be our policy’s deductible amount. After considering it all on a night’s sleep, we decided to return the check the following day. Neither of us wanted to part with a grand. That’s a lot of egg foo young. Don’t question my priorities, I won’t question yours. Our car is a 2007 Toyota with just over 150,000 miles on it. I had downgraded the insurance coverage on it a couple of years ago when we started discussing how much longer we would keep it. At the time, I was only thinking about increased repairs and possibly throwing good money after bad. I really hadn’t considered the likelihood of having an accident (my only other one was also a fender-bender at a grad school parking lot in the mid-eighties). So this forced us into make a quick decision about our current priorities. For the last year we actually have been looking at different cars that we might like. It’s been mostly a passive process of looking at other vehicles on the road, plus buying the Consumer Reports car issue. We even got as far as narrowing our interest down to three different models.¹ In December we opened an account at a local credit union to prepare for the eventuality of getting pre-qualified for a new car loan. We had no plans to do anything, but we wanted our ducks to be in a row for when we did. Other things continue to take precedence on our list of desires, namely new furniture for our home. We’ve been busy over the last year painting rooms, acquiring a few furniture pieces, and slowly but surely getting the place in shape. A new car is desirous but not an urgent needed. So for at least the rest of this year, we’ll be the ones that you see on the roads with that dented Toyota. Go ahead and “tsk tsk” away at us. Oh, and that cholesterol uptick? I’m being told that my mid-day lunches are now to include more salads. I’m suspecting that’s a strategy conceived to keep me away from shopping center parking lots. ¹ The Kia Soul, Toyota Rav4, and Toyota Camry are our current contenders. ² At least “not yet” in our case. I will start regular distributions from my 401(k) when I turn 62 in three years, and even then I plan on a frugal amount to start. I am with you 100% on the backup camera. That’s a must, and was so even prior to this accident! The funny thing is, my wife nearly had the same thing happen at the same spot about a week later. Needless to say neither of us are parking there again. I see nothing wrong with driving a dented older car. Of course I’m a woman who drives a 2003 Honda Accord because I’m too cheap to spring for a new one with all the fancy doodads and thingamajigs on it. I’m glad you’re ok, btw. And that you got a fun story out of it. Hehehe Marty. I have a Mazda CX3. Try and find a higher car that way easier to get in and out. I love my reversing camera. The sensors also alert me if there are cars/bikes/people coming so I don’t back out into something. It’s handy to have. My old car didn’t have it and I’m thankful the new car has it. Hubby insisted that I have most of the safety features. The only thing I haven’t got is falling asleep and the car alert me if I should cross to another lane. Now that I don’t have to drive long distance it’s not an issue. I have a Toyota Rav 4 and love it but then again I’m not a car person and don’t know much about the others. I was thinking about replacing mine just for more safety upgrades. My husband has the “someone’s nearby beepers” and I like that. I do have a rear camera and it’s mostly good. At certain times I get bad glare on it and can’t see it. Unfortunately from a financial perspective I shouldn’t upgrade. My car is 5 years old and has less than 20K miles on it. I am amazed you are a one car couple. We talk about that because it makes sense except he wants the big SUV to haul wood and stuff and I like a smaller car (that’s also red). Maybe one day. Cars with small dents don’t look so bad unless they are rusty. My wife moved out to California to live with me before we got married, and we did talk about getting her a car then. But we seemed to manage with just one so well. Then I retired and that’s all we’ve ever had since. It’s worked well, and of course the savings with insurance, etc., has been nice. But I am thinking that maybe when we finally do get a new vehicle that I’ll just keep this one since it’s paid for already. I love the Rav4, and it’s definitely a serious contender. But I’ve also just wanted a nice sedan for ages. So we’re still working it through our minds. We have time yet. Good gravy! How fast were you going? It seemed to me…particularly in Florida, it would be an AC/DC thing. Both were backing out…paying no attention (🤣), so what’s the problem? Here’s a tip I learned in EMS. NEVER pull into anywhere…driveway, parking place…whatever. Rule #1. If you’re driving an ambulance…or a car, and need to get out quick, it’s much easier to see to I pull out than back out. Rule #2. Never get more than a car length behind the person in front of you, because…if you’re driving an ambulance and you get an emergent call, you can easily whip out…and if you’ve ever been hit from behind and shoved into the back seat of said car in front of you and break your neck…you tend to hang back…especially at a stop. All good advice, Laurel! OMG, we must have each been going maybe two mph at the most? I really don’t know… it happened so quickly. But it was enough to create that dent. I’ve always been so careful, but obviously I just wanted to get home and eat! 🙂 The next car will have a rear view camera, and hopefully that will help. But, yes, pull out rather than back out if you possibly can. In general when I see a car dented in the back, I assume the other driver was to blame for following too close. And I’m siding with you on this one., you were both backing up so why isn’t the other driver at fault? Well at least no one was hurt. Most importantly Marty, did you and Gorgeous got to eat the egg foo young for lunch that fateful day? Probably the most important question of all, isn’t it Elizabeth?! One of us ate the egg foo young. The other sees it greasy, unhealthy, and full of calories. Hrrumph! Reading between your words…I bet that G hopes that you are forever turned off by Egg foo young…a learnt response based on association/conditioning? 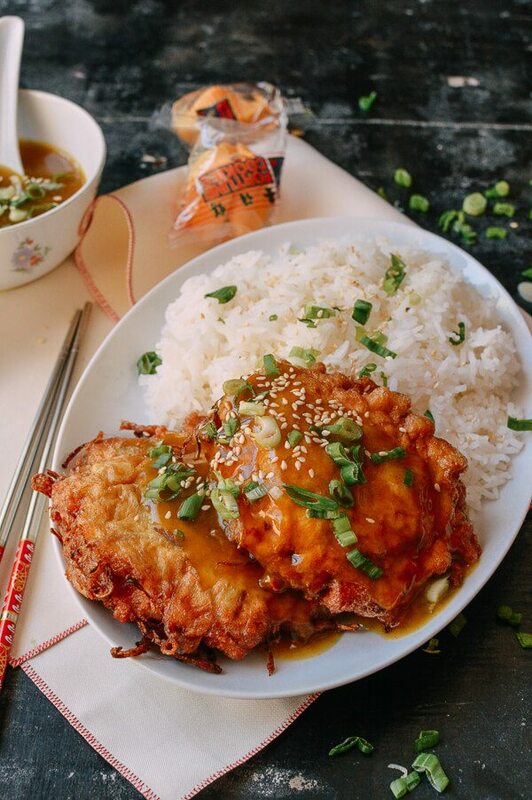 The process of simply getting some Egg foo young will never be the same. Well darn! Having recently experienced a similar fender bender (not my fault 😇) I can sympathize. By the way, I’ve owned a Rav 4, and really liked it. It’s still in contention, thanks! Hey Marty, I had a similar experience during a downpour about four years ago in a grocery store parking lot in Vermont. It is amazing how fast you can blowup your early-retirement budget when you are in a hurry to eat lunch. I admire your financial planning and decision to just ride it out with the dent. After all, we could all use a little body work at our age. Hate to say this, but I’ve backed into poles, as has hubby. At our last house he often “hit” the side wall of the driveway. I think every vehicle had that scratch/dent. He did fix the one he put into my last car and his “good car”…but his current pick-up truck still has its dent. We are a 3-car family. Yeah, crazy. My car, his car, and the pick-up. I do think we could get to 2, but I’d be hard pressed to get to one here in Cinci. Interestingly, we are one car in Florida where there’s more stuff within biking range. Glad it was just funny stories and not any injuries! OMG…I loved this!! Thanks for making me laugh. Is that mean that I laughed at your misfortune? I had one car that got dented and it was the other persons fault and we got the insurance money and spent it on something else and never fixed the car. 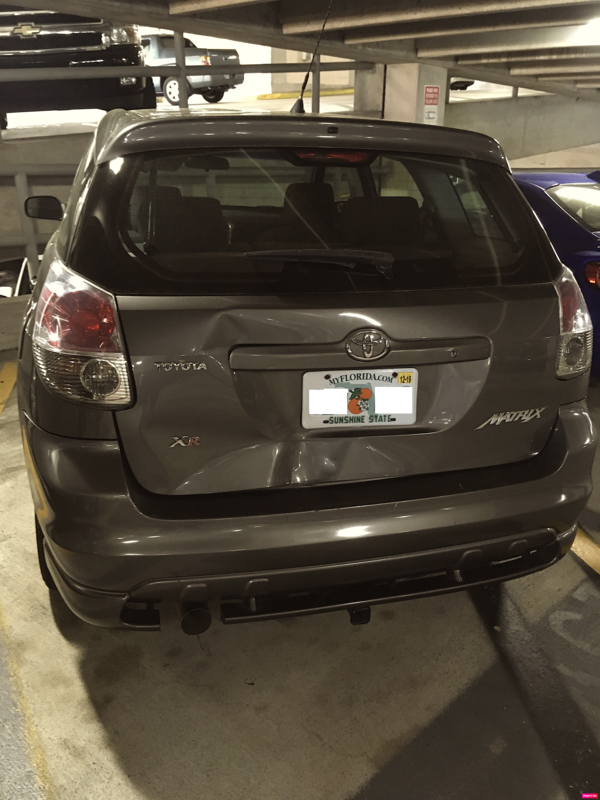 Don’t judge me… A few months ago a HUGE truck slowly backed into me while I was waiting at the Costco gas pumps. I honked and honked as I watched him slowly crunch my drivers side door. It was surreal. He was a lovely person and didn’t want me to report this to his insurance. I sensed that he had a health issue – maybe Parkinsons – and that this was not his first accident. I agreed but took his insurance info just in case. He was true to his word and paid for all of the repairs and my rental car. I know that this has NOTHING to do with your accident, but since we’re taking dented cars (repaired or not!) I thought I’d share. Babble is probably a more accurate description… And FYI, we could NEVER survive with only one car – we go different directions all the time. Hats off to you two! And enjoy your MSG! OMG, I can only imagine how you must have felt to see the impending damage happen to your car — a real slow motion moment, that’s for sure. I’m glad he was good as his word on paying for everything. In my own case, I wish now that I had never involved the insurance company. He really suffered no damage at all, save for a paint smear on one break light. But in my case, despite our returning the check (which arguably maybe we should’t have? ), I’m sure our premium will go up next year because of this. Not all accidents necessarily need to be reported, I suppose. Ah well, it’s my cross to bear for always following the rules (sudden thought: can a Jewish person actually “cross to bear?”! ).